(To honor the memory of ICS founder and longtime executive director, Estelle Shohet Brettman, who died a quarter century ago in Boston on June 24, 1991, the ICS is releasing archival materials that testify to Brettman's life and legacy to the society that she endowed in perpetuity. Many of these testimonials are of longtime ICS board members, who worked long and hard with Brettman on the ICS's earliest endeavors. Their words, in honor of Brettman, beautifully express the sincerity and authenticity of her vision. We feel her vividly present through them, enough to make this tribute bittersweet. Below is the first of the series, a transcript of the introduction to the inaugural lecture in 2000 of the permanently-endowed Estelle Shohet Brettman Memorial Lecture Series at Boston's Museum of Fine Arts, which was delivered by Prof. Thomas F. Mathews on 'A Clash of Gods: Christian versus Pagan Icons”" . 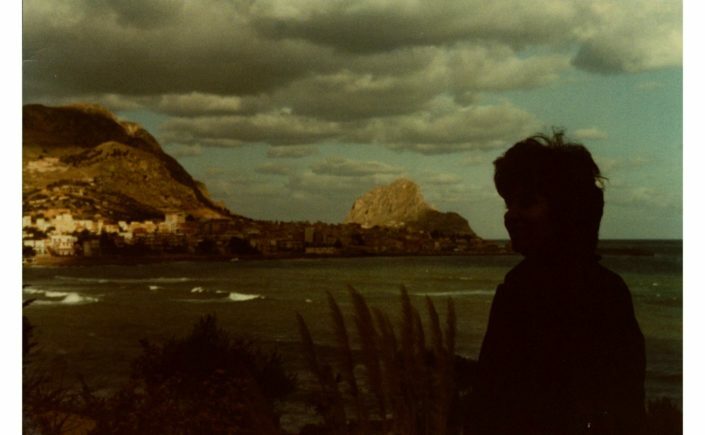 Photo: Estelle Shohet Brettman at the Hotel Zagarella, near Palermo, on January 7, 1978, shortly after her excursion to the necropolis of Palazzuolo Acreide and discovery of what she identified as a menorah incised into a stone. This incident, as noted below, inspired Brettman to try and track down other signs of Judaism in Greco-Roman sites). "Thank you all for coming to help us celebrate the inauguration of the Estelle Shohet Brettman Memorial Lecture Series at the Museum of Fine Arts, Boston. Many of you knew Estelle Brettman quite well: many others, I'd guess, not at all. May I take just a few minutes to tell you a bit about Estelle and how the International Catacomb Society, the ICS, came to be? Estelle was exposed early to the art and archaeology of ancient civilizations. Her high school years were spent at Girls' Latin School in Boston, which was then in the building across from the little park next to the Isabella Stewart Gardner Museum. She endured a real old-fashioned Classical education there. A large plaster cast of Athena dominated the main entranceway, and the Parthenon frieze ran around the top of the Assembly Hall. Latin was inescapable, as was Ancient History, presided over by the terrifying Miss Green. But the best part of the school's being there was having the Museum of Fine Arts nearby, with a court filled with plaster cases of gods and goddesses, the models for art students and a glimpse of the idea for impressionable adolescents. There was another influence in Estelle's life. She wrote of her grandfather, a revered rabbi, known as the wise man in his town, and her father, a physician learned in both the Talmud and the Bible, and who devoted his spare time to writing a book called Kinships, based on the belief that "fundamental ties unite all men." At Radcliffe College, she strayed into science and worked for a while as a fish biologist. But her interest in art took over. She became fascinated by ancient carved gem stones and their iconography. She had begun to collect and sell antique jewelry, which gave her a wonderful reason for combing Europe and North Africa in search of unusual and interesting pieces. She loved being in italy, and spent as much time as she could in exploring archaeological sites. She wrote of the event, in 1978, that, she said, gave a new direction to her life. "Exploring a remote Hellenistic to Byzantine cemetery in Sicily (at Palazzuolo Acreide), I stumbled over, and dislodged, a large rock. On the underside of the rock, I saw a crude graffito of a menorah, the quintessential symbol of Judaism. I had explored catacombs in Rome and Israel but this was the first time I had ever seen a Jewish symbol in such an unlikely place... I wondered how many other artifacts bearing such symbols might remain undiscovered in unexpected places..."
Further studies of the art and inscriptions of the catacombs reinforced her perceptions of common sources in the ancient world, and the pervasive interchange of influences in Greco Roman society. Estelle Brettman saw the catacombs, which, over the centuries, had suffered natural damage, periodic neglect, and vandalism, as a precious archive that should be preserved and that has much even to teach the modern world about our common humanity. She started the International Catacomb Society to draw attention to the value and fragility of these structures, that were mostly mysterious, misunderstood relics suitable only as settings for spooky movies. Her first exhibition at the Boston Public Library was a revelation for many of the visitors. They were surprised by the beauty of the underground cemeteries, they were struck by the immediacy of the messages in certain inscriptions. Most people did not know that there were Jewish catacombs as well as Christian; how very similar they were to one another and how much the two religions shared. On behalf of a cause she believed in, Estelle was relentless. She would approach anyone to seek help. This Jewish lady from Boston's Beacon Hill found wonderful friends in the Vatican and Pontificia Commissione di Archeologia Sacra in Rome. Invited to mount an exhibit in the Castel Sant'Angelo, she received unbelievable help from members of the Vatican staff. It is gratifying to have this lecture series established here. Estelle loved the Museum of Fine aRts and was a devoted Educational Aide, Gallery Instructor, and lecturer here. She would have appreciated Prof. Mathews' topic of today; she was a great believer in the possibility that even conflict can be influential."